Professor; Ph.D. in Physics, University of Massachusetts-Lowell, 1992. M.S. in Physics, University of Massachusetts-Lowell, 1988. B.S. in Physics, National Cheng Kung University, Taiwan, 1981. In 1992, he was a post-doc at Bryan Kohler’s group of UC-Riverside. In October 1992, he joined UNIAX Corporation (now Du Pont Display) as a device physicist. 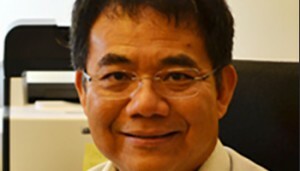 Yang joined this department as an Assistant Professor in January 1997 and was subsequently promoted to Associate Professor in 1998. He has been a full professor since 2002. He holds the Carol and Lawrence E. Tannas Jr. Endowed Chair in Engineering since 2011. He is a Fellow of SPIE and the Electromagnetics Academy. He is a materials physicist with expertise in the fields of organic electronics, organic/inorganic interface engineering, and related devices, such as photovoltaic cells, LEDs, and memory devices. He is a Thomson Reuter Highly Cited Researcher (2014, Materials Science & Chemistry) and has published more than 270 refereed papers with over 32,000 citations (H-index 87). He has given more than 160 Invited presentations on his research work and has received 20 issued US patents. Dr. Yang’s research interest focuses on functional electronic devices (solar cells, thin film transistors, light emitting devices) which hold promise for cost effective applications. The research is a comprehensive system involving rational design of materials (organic semiconductors, hybrid perovskites, inorganic nanomaterials), the control of film morphology, crystal growth, fundamental understanding of electrical properties of the new materials and structures, understanding of nanoscale structure-property relationship, control and understanding of interface s in devices (organic/organic, organic metal etc. ), new device architecture development etc.